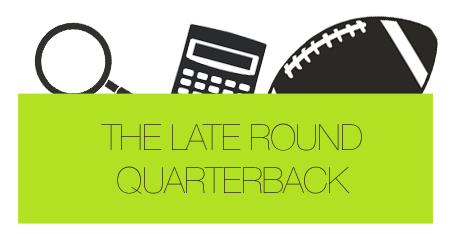 The Late Round Quarterback staff put together their quarterback rankings for the 2013 season. The following rankings are based on standard quarterback scoring in redraft leagues, where each touchdown is worth four points and one point is rewarded for every 25 passing yards. It appears I’m the only one thinking Aaron Rodgers is the best fantasy passer in the game, as the other six staff members ranked Brees ahead of him. I expect both the Saints and Packers to run the ball a little more in 2013, but Rodgers, even without Jennings, is more efficient of the two. He’s also got sneaky legs. It was interesting to see most of us are fairly high on Peyton Manning, as everyone ranked him either 3rd or 4th outside of Phil Culbertson. Many are expecting his healthy offseason and new weapon, Wes Welker, to bring fantasy gold in 2013. Some big surprises in the top 10 include Chad Scott’s ranking of 9 for Tom Brady, my 6th overall rank of Matthew Stafford and Sal Stefanile’s 4th ranked grade for Robert Griffin III. Chad seems to be low on the mixed up Patriots offense, while Sal seems to think RGIII will come back healthy. In regards to Stafford, I like to think his touchdown rate in 2012 was slightly flukey given the 727 times he threw the rock. Expect that number in the touchdown column to increase, especially with Reggie Bush in Detroit. The top-12 or so quarterbacks are fairly obvious, and things don’t get incredibly erratic until the teens. Carson Palmer saw the most variation in rank, as Chad ranked him at 14 and Austan chose to place him outside of the top 25. The offensive line in Arizona is certainly a concern, but Bruce Arians vertical offense must look attractive to Chad. Sam Bradford’s another passer who’s been under a critical fantasy eye since the start of the off-season, and many are predicting big things for him in 2013. Phil certainly thinks so, ranking him 14th overall. Keith, Austan and Ladd, however, don’t think Bradford will finish as anything better than a low-end QB2. I took a rather safe route by ranking him 18th, but I certainly see upside for the entire Rams offense, especially once they start clicking throughout the second half of the season.